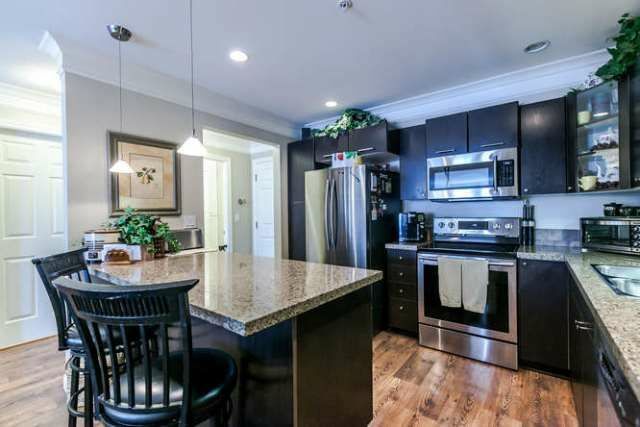 Gorgeous 2 bdrm, 2 bath s/facing suite finished like a show home w/ dble crowns, mouldings, laminate flrs, gorgeous kit w/granite counters & stainless appliances, Laundry w/custom blt cabinets & attractive décor. Entertaining is easy w/spacious liv rm w/laminate floors, bay window & dr to balcony, din area, gorgeous kit w/breakfast bar, laminate flrs, granite counters & stainless appl. (fridge, stove & microwave are new) 2nd bdrm set up w/media centre & electric F/P. Spacious mbdrm w/gorgeous crowns & mouldings, customized mirrored closet drs & 4 pce ensuite. Laundry w/tons of custom blt cabinets for storage. The entire suite is wired for sound. South facing outlook means you aren't looking out to another building. Walking distance to schools.